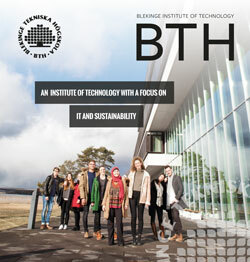 Blekinge Institute of Technology, BTH, has a distinctive focus on IT and innovation for sustainable growth. BTH’s task is to contribute to a more sustainable societal development through higher education, research and innovation. We conduct education and research at a high international level, focusing on IT integrated with other subjects such as engineering, industrial economics, spatial planning, design, and health sciences. We focus on the future of our students, and offer courses and study programmes that prepare them to face societal challenges. The aim of our research is to contribute with solutions to and innovations in crucial fields. In all our activities, we highlight innovation, sustainability as well as collaboration and exchange with industry and society. BTH offers student-centered and research-based education with clear links to wider society emphasising creativity, independence, initiative and entrepreneurship. Our goal is that our courses and programmes will give students opportunities to build a career within their chosen field. Our focus is not only on what happens during the studies, but also what happens after. Therefore, many of our courses and programmes include projects tied to real life demands and are conducted together with industry. This way, the students will gain insight into their future profession and contacts with potential future employers already during their studies. Students at BTH are part of an international environment that provides them with the opportunity to build global networks for the future. BTH makes the most of being a small university. Our students quickly get to know one another, and the study groups are small. Students can easily get in contact with teaching staff and other employees. This creates a rewarding, interesting and safe study environment. The research at BTH is conducted at two faculties within the fields of engineering, IT, spatial planning, industrial economics, design and health sciences. Despite its relatively small size, BTH has a great deal of research. Today, research and research studies account for more than one-third of our activities and we intend to increase that share even further. We conduct research in a large number of fields all connected by applied IT, which researchers approach from different perspectives. At BTH there are three research environments with funding from the Knowledge Foundation (KKS). One focuses on creating resource efficient systems for the analysis of large amounts of data. The research is conducted in cooperation with a number of companies including Ericsson, Telenor and Sony Mobile Communications. The other research environment focuses on the production of digital methods and tools to develop the next generation of sustainable products in the manufacturing industry. The research is carried out in collaboration with a number of companies e.g. Volvo, Tetra Pak and GKN Aerospace. The third focuses on developing new working methods and methods so that Swedish companies can develop future software intensive products and services in a competitive way. The research is carried out in collaboration with Ericsson, Sony, Telia Company, Handelsbanken, Swedbank, MaxKompetens, Time People Group, Tolpagorni Product Management, QTEMA and Fortnox. In addition, BTH runs a major project, funded by the Knowledge Foundation, aimed at developing visual and interactive systems focusing on the human being. The project is conducted in collaboration with WIP, Ericsson, Axis Communications and Tobii Pro. BTH runs an industrial licentiate graduate school, Professional Licentiate in Engineering, which focuses on developing applied industrial research. The purpose of the school is to meet industry’s need for increased expertise, while facilitating the introduction of applied research in industry. The PhD students work in parallel with their studies and they get the opportunity to focus on an area to build competence and develop new ideas. BTH offers an international environment and an open atmosphere where you can build your own network. Today there are several international collaborations, both in education and research. BTH is involved in some 30 collaborations with higher education institutions in Europe, and another 30 or so outside Europe. This means that agreements exist with universities all over the world. Both of BTH’s campuses are located by the sea, which creates a special atmosphere. On campus there are of course lecture halls and libraries, but also restaurants and cafes, student housing, a students’ union, and the unique opportunity to swim in the sea; in other Words – an inspiring study environment. All of BTH’s courses and programmes in engineering, IT, spatial planning, industrial economics, design and health sciences are offered at BTH’s main campus in Karlskrona – Campus Gräsvik. The campus is located at the centre of Blue Science Park – a business network within the IT and telecommunications industry. This provides great opportunities for cooperations within both education and research. Most of BTH’s programmes in digital media are offered at Campus Karlshamn. NetPort Science Park, with businesses within the digital experiential industry, is also located on campus. In this film you get more information about BTH and our two campuses located in Karlskrona and in Karlshamn. Do you want to know more about BTH? In this folder you get more information about our education, research and collaboration.